On September 26-29, IRRI postharvest experts held training sessions in Chainat and Uttaradit provinces in Thailand. This training sought to improve rice quality through better postharvest technologies and practices. Participants were contract growers, rice mill owners, and machine operators. Engineers Caling Balingbing and Joseph Sandro, IRRI mechanization and postharvest experts, conducted a 4-day training course for key stakeholders of the Kellogg’s-funded postharvest loss reduction project. This initiative aims to ensure high-quality rice for use in the company’s products. Techniques in rice harvesting systems were relayed through lectures and hands-on exercises, including basic operation and setting up the combine harvester to get an efficient output. Factors that affect the drying process were also discussed. Engr. 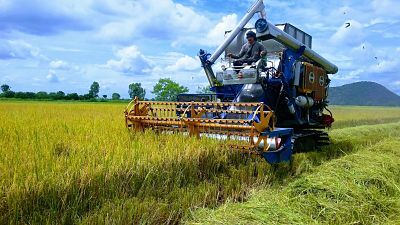 Balingbing showed the participants how to operate combine harvesters and explained the importance of correct machine settings in achieving the desired output. He also taught them how to measure losses from combine harvesting by using grain loss collection pads in the field. “We hope that this training will equip the participants with the necessary skills and knowledge about the important principles of postharvest management of rice, particularly on combine harvesting and dryer operation," he noted. "This knowledge will help avoid huge losses of rice along the value chain. It will also help maintain the quality of milled rice products that reach the market, especially Kellogg’s customers. Engr. Sandro discussed drying principles and talked about technical and environmental factors that affect drying. He also conducted a simple experiment that illustrated how different drying conditions affect rice quality. Noppadol Saenpo, managing director of Asia Seed and Grain Production Co. Ltd., expressed his appreciation for the knowledge they gained and emphasized its role in enabling his staff to apply techniques in harvesting rice and minimizing losses in the field. “This training complements what the Thai Rice Department conducts whenever we have new staff ," he said. The owner of Korat Yongsanguan Rice Mill remarked, “I am very much delighted upon knowing the process and conditions as to temperature and humidity to dry paddy with mechanical dryer to attain best quality of paddy for milling and storage.” He added that the knowledge he gained will be cascaded to his staff that are involved in rice mill operations. In November and December, IRRI’s Mechanization and Postharvest Team will conduct two more training courses on storage and milling. For more information about this initiative, contact the Mechanization and Postharvest Team at postharvest@irri.org.